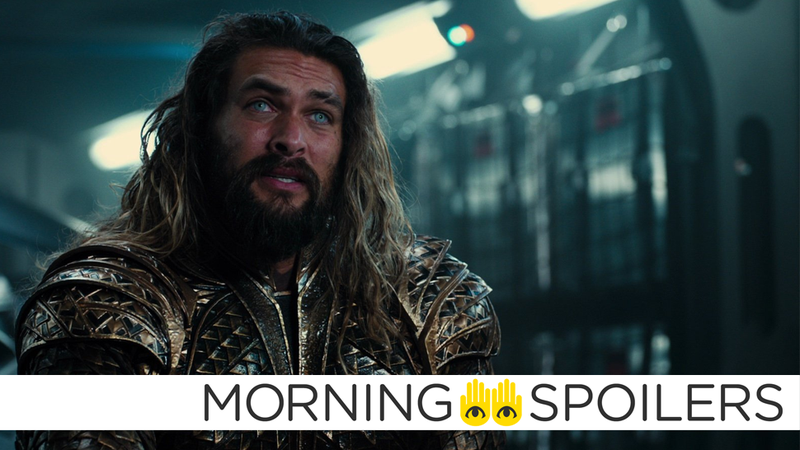 Arthur’s getting a more comics-inspired look in the solo Aquaman movie. The new Men in Black film adds another intriguing cast member. David F. Sandberg discusses Shazam’s movie suit. Argo City returns in new Supergirl pictures. Plus, good news for Krypton, a tiny look at Matt Groening’s new fantasy series, and teasers for Arrow’s next season. To me, my spoilers! Sony Pictures has announced Chris Miller and Phil Lord will produce the company’s next animated feature from director Mike Rianda (Gravity Falls). The story concerns a dysfunctional family caught in the middle of a Maximum Overdrive-style tech uprising during a road trip. With the help of two malfunctioning robots and the family’s delightfully overweight pug, the Mitchells will have to get past their problems and work together to save each other and the world! Following “an intense bidding war,” THR reports John Wick director Chad Stahelski and Ryan Condal, the creator of USA’s Colony, are teaming for a film adaptation of Analog, a brand-new comic book series from Image (the second issue was released earlier this month). The story concerns a not-too-distant future in which people called “Ledger Men” carry people’s secrets in handcuffed briefcases following an event called, “The Great Doxxing,” in which everyone on the planet’s dirty laundry was released for public consumption on the internet. The latest issue of Licensing Magazine includes a short, incredibly vague synopsis. A stark new poster from the Las Vegas Licensing Expo removes any mention of the X-Men, entirely. Director David F. Sandberg fielded questions regarding the recent costume reveal on Twitter. Jodie Foster reveals she only treats microchipped criminals in a new clip from Hotel Artemis, which also introduces Dave Bautista’s character, a hulking security guard named Everest. Season two premieres Monday, June 25th on CBS according to Ian Anthony Dale on Instagram. TV Line’s Brian Ausiello has some new info on Arrow’s seventh season. ...while Oliver’s in Supermax, Team Arrow will have to contend with an ambitious, young, anti-vigilante recruit at the SCPD. (If vigilantes were vampires, consider her your Buffy.) Another recurring role to be cast is that of a successful tech whiz who is gay, and who harbors a heartbreaking past. Season 3B is a “rollercoaster ride” for Magnus Bane, according to executive producer Todd Slavkin. It’s heartbreaking. But it’s also beautiful, because he learns a lot. He learns how to live in the moment, something he never had to do when he had powers. Season 3B is such a rollercoaster ride for Magnus Bane. We loved his arc in 3A, but for Harry Shum, Jr. as an actor, it’s a hell of a journey. It’s beautiful and profound and it’ll break your heart. You’re in for a ride that’s really intense to watch. Alura returns in photos from next week’s episode, “Dark Side of the Moon.” Head over to TV Line for more. Meanwhile, Comic Book has word the series is looking to cast a new transgender character named Nia Nal. ...a confident, wunderkind of a fashionista. Once a political speechwriter, Nia is the newest addition to the CatCo investigative reporting team. With her she brings sparlking wit and biting humor but under that banter-y, chic facade, lays a soulful young woman who has much to offer the world. Teaser art from Matt Groening’s new animated fantasy series has been posted to Twitter. Ridley Scott discusses his famous Apple commercial in a clip from the next episode of James Cameron’s documentary series.